From its premium construction and comfortable ergonomics to its powerful programming features, the DX20 delivers a pro-class flying experience that is second to none. In fact, it's the only transmitter in its price range equipped with machined aluminum gimbals. The Spektrum™ AirWare™ software that comes in the DX20 gives expert pilots all the programming features they could want along with a few they never knew they needed. And its intuitive SimpleScroll™ interface makes navigating menus and changing settings as simple as "roll and click." The airplane programming includes a multi-engine control option that, when activated, allows you to independently adjust and control up to four engines or motors. You could use it to make individual run-up checks on the ground or synch propeller speeds in flight. It also makes it possible to use asymmetric thrust to tighten the turning radius of large models during ground operations. When active, ProTrim will allow you to make small dual rate, expo, mix and differential adjustments in flight. With voice alerts, you can keep tabs on important functions without ever taking your eyes off what you're flying. They can be programmed to call out what flight mode you've chosen or report telemetry information on demand. If an alarm goes off, you won't have to look at the transmitter display to see what's happening. The DX20 will tell you. In addition to extensive airplane and heli programming, the DX20 has the most impressive sailplane programming features you'll find in any handheld transmitter. Ten available flight modes, 5 wing types, 3 tail types, 2 motor types, flap delay with elevator compensation - it has it all. You even have the ability to adjust individual servo characteristics (end points, travel, center, etc.) for all 20 channels. Program a sequence of switch-activated events with time delays between each event. For instance, with a flip of the gear switch you could have an auxiliary channel open landing gear doors, then have the retract channel lower the landing gear, followed by the auxiliary channel closing the gear doors after the gear is extended. No more will you need a complicated network of little boxes littering your fuselage if you want to balance servos. You can precisely balance the output of swashplate servos or multiple servos on a single control surface with the transmitter using a 7-point curve mix. 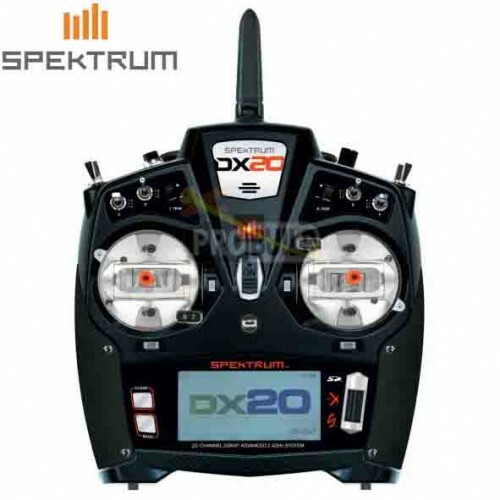 This exclusive Spetkrum technology gives DX20 users the ability to wirelessly link up with other Spektrum transmitters and specially-equipped Spektrum FPV headsets. Once bound to another transmitter or component, ModelMatch™ technology will allow the DX20 to re-link without having to go through the bind process again. Link with specially-equipped Spektrum FPV headsets to wirelessly control head tracking and remotely change video frequencies on the fly. The enormous capacity of the DX20's on-board memory means you will rarely, if ever, need to juggle models between transmitter memory and your SD card. The model memory menu is easier to navigate too. Only memory slots with model settings saved to them will appear. You won't have to scroll through empty slots or move models around if one is deleted. 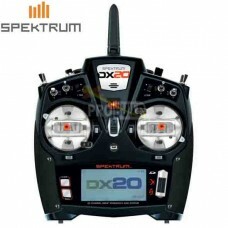 Because the DX20 uses the same AirWare™ software as many other Spektrum transmitters, you can share model setups across platforms with almost any Spektrum pilot. Register your DX20 and receive alerts whenever Spektrum Airware software updates are available. You also gain access to a growing library pre-set model setups for the most popular Horizon Hobby aircraft. The DX20 has all the programming functions you need to fly everything from collective pitch helis and multi-rotor aircraft to competition sailplanes and giant-scale jets. Both the DX20 and the AR9020 receiver it comes with have X-Plus channel expansion capabilities. This means you can add up to eight extra channels with an X-Plus channel expansion module (SPMXP8000 - sold separately). Just plug the module into the receiver, bind it and then assign the extra channels to any function you want. Fly Smarter with Built-In Telemetry. Built-in telemetry gives you real-time information on things like your model's battery voltage, signal quality, engine or motor temperature, airspeed, altitude and more. You can have the DX20 recite this information on demand using programmable voice alerts. You also have the option of logging telemetry data to the transmitter's SD card for review after the flight. To use the telemetry function, your model must be equipped with a Spektrum telemetry module and telemetry sensors (all sold separately). You will find there are Spektrum telemetry sensors for tracking just about any model function you can think of, and new ones are being added all the time. Superior Ergonomics. Made to Fit the Way You Fly. The weight distribution and ergonomics of the DX20 have been optimized to fit the way you fly. The result is a sense of balance and comfort that perfectly complements the speed and precision of DSMX technology.